Pharmaceutical, Biotech, Chemical, Food and Beverage companies have standardised on Aflex Hose’s patented products as the best designed and most reliable choice for process fluid transfer in their manufacturing plants worldwide. From raw materials to finished hose assemblies, their hoses and end fittings are manufactured at factories in the UK and the USA. This total control of manufacturing and design gives them an unrivalled ability to meet customers’ specific needs, whatever the industry or application requirements. Whether it is tanker off-loading, product transfer or an integral part of your process, Aflex have a PTFE hose to solve your problems. 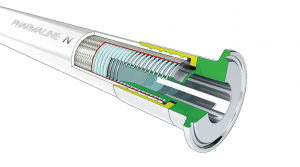 “We are very proud to be partnering with another world class manufacturer such as Aflex Hose. This product is a fantastic addition to the VPS portfolio and compliments our range of PTFE lined valves. We are very excited about where this new additional product will take us” says Managing Director, Steve Pearson.